Green fig and saltfish is a simple trini meal I like to partake of once in a while. And, with banana trees in my backyard this dish is always welcome. When the bananas are full, I just use my trusty sharp cutlass ( machete) and with one clean cut, I cut the bunch of green bananas. To acclimatise you all with the conventions used with quantifying ( Big word people! Big Word!) green bananas I’ll explain a bit. Fig is our trini term, and by extension Caribbean term, for bananas, so don’t get confused with the other “fig”. A bunch is the bunch of bananas; a hand refers to one of the smaller “bunches” that make up the large bunch; a grain of fig refers to one of the individual bananas that make up the hand. I hope you’re not that confused. Anyway the pictures below will give you a better idea. By now you may realise that saltfish is really a staple food in our trini diet. We eat saltfish in accras, buljol with fry bake and also dumpling. It is a wonderful addition to the trini menu and also a life saver coming close to month end, when the fridge starts to look empty and you start to get creative with the little that you have. Trinis know what I’m talking about! Ent? 🙂 lol So, I hope you enjoy this trinistyle way of cooking saltfish or salted cod as most will know it. Enjoy Green Fig and Saltfish… as trini as it could get! A grain of fig. Mark the green fig (banana) with a knife as shown. 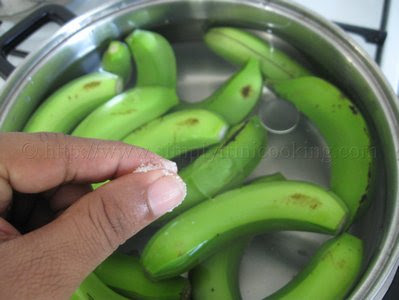 Boil until the skin changes colour and the bananas are tender. Note: We usually leave the bananas in the water until we’re ready to serve. This keeps the bananas soft. Boil the saltfish for about twenty minutes. Clean and break into smaller pieces. Note: Even after boiling the saltfish, it may still be a little salty. 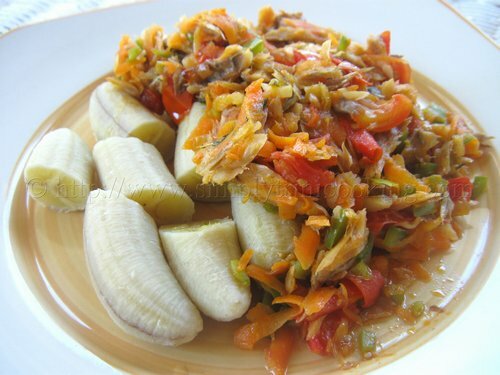 To remedy this problem, place it in a bowl of water and squeeze the pieces of saltfish, handfuls at a time, and place in another bowl when finished. That should get the excess salt out. Don’t over squeeze though; we need some salt to flavour the rest of ingredients. In an iron pot, saute the onion and garlic over a medium flame until translucent. Add the saltfish and mix thoroughly. Add about 1/2 cup water and let simmer for 1 minute. The finished saltfish. Serve over the green fig (bananas). Ah Gone! Don’t forget to leave your comment on green fig and saltfish in the comment box below.